The graduation ceremony will be held at the school on Sunday, June 2, at 1:30 p.m. This year’s graduating class will be Trey Araujo, Erin Brown, Ian Chickering, Eli Dagostino, Spencer de Langavant-Sahr, Zachary Dupon, Kaelin Nelson, Ruth Oliviera, Teo Reidy, Zachary Smalley, Erin Sullivan and Oscar Thompson. Many of the students, including Miss Brown and Mr. Dupon, have attended the charter school since kindergarten. The students’ varied plans for life after high school are emblematic of the mission of the charter school which promotes freedom and individuality. Miss Nelson has already begun her education in the culinary arts at Johnson & Wales University. Mr. Sullivan has elected to take time off from school to complete his art portfolio and eventually study digital art in Washington. And Mr. Dagostino is heading to New York city to work with a team of four professional photographers. Most of the other students will attend college next year, studying international business, environmental science or culinary arts, while others plan to work or travel first. 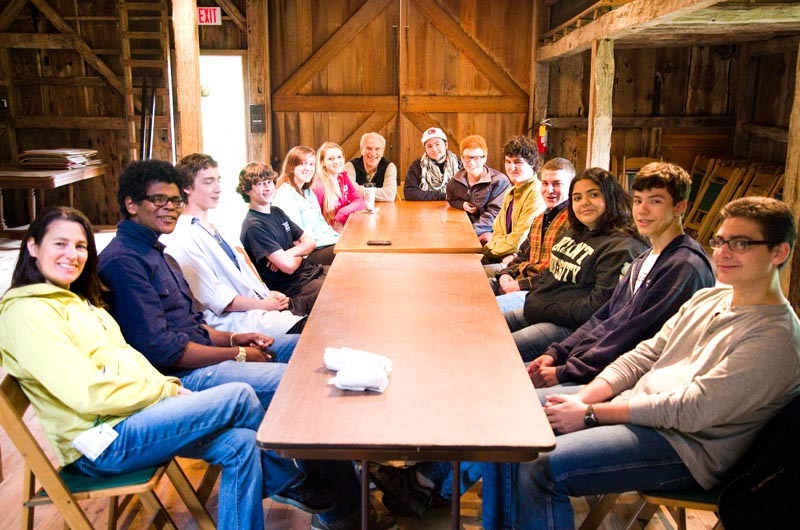 The Martha’s Vineyard Public Charter School creates a different kind of educational experience, especially once students reach high school. Instead of being required to complete a specific curriculum and take exams for grades, students must produce a portfolio project each of the four years, one of which must be a written project. According to Laura Sargent Hall, president of the school’s board of trustees, students may do whatever kind of project they choose as long as it is “in-depth” and is pre-approved by the school’s administration. Mr. Chickering says he still has not finished the screenplay, which he began last August. The delay is not for lack of inspiration. Instead, Mr. Chickering has continued to solicit feedback from experienced screenwriters and even from his peers. He and his classmates agreed that this process of peer review is one of the charter school’s defining features. “It let me take the time to steal people from their classes and force them to read my screenplay,” Mr. Chickering said. The students say that the charter school’s small size fosters an important sense of community. “We’ve known each other forever,” Mr. Dupon said. This sense of community has helped students like Mr. Chickering to be more open with themselves and with their work. “The peer review process helped me to be more open to criticism,” he said. The seniors agreed that they appreciate the mutual respect students share with their teachers. “We have so much freedom — we give them the respect they give us,” Mr. Sullivan said. Although they love the charter school, the graduating seniors identified a few areas where they feel the school could improve. “We need a new gym,” Mr. Dupon said. “We actually need to have a gym before we can have a new one,” Mr. Thompson said. Students also expressed an interest in seeing more cooperation between the charter school and the Martha’s Vineyard Regional High School. They mentioned the fact that charter school students are not permitted to compete on the regional high school athletic teams. “It would be nice if there was a little more openness between the schools,” Mr. Chickering said. “Students are faced with the choice of staying at the charter school and not playing their sports or moving,” added Maurice (Buck) Reidy, a member of the charter school’s board of trustees and Teo’s father. In looking back and looking ahead, the students said they are feeling excited and a little nostalgic. The group’s consensus was that they could hardly believe they were graduating. “It’s like a dream,” Mr. Smalley said. “It’s a special place,” Miss Nelson added and the other students nodded in agreement. “It’s a home for me,” Miss Brown said. “I can always ask for help when I need it.” Miss Brown is the youngest of five children in her family to graduate from the charter school. Teo Reidy described an experience that he said gave him some perspective on how far he had come. It is a charter school tradition that younger students give personalized gifts to the graduating seniors. Mr. Reidy was assigned to the kindergarten class and spent some time with the class so that they could get to know him. There are now 327 students in English language learning (ELL) programs in the Island public schools.